Matteo's Landscaping Company, Inc. is a professional, licensed and insured hurricane cleanup and debris removal contractor based in Southwest Ranches, Florida. We have the necessary equipment and specialized knowledge required to safely and efficiently remove storm damage and haul away large amounts of debris in Weston, Pembroke Pines, Coral Springs, Fort Lauderdale, Plantation, Sunrise, Boca Raton, Delray Beach, Boynton Beach, Sunny Isles, Miami and throughout Broward, West Palm Beach and Miami-Dade counties. Whether you are a property developer, owner or manager, Matteo's Landscaping will take care of hurricane cleanup and debris removal needs, eliminating risks and getting the job done quickly. Our ISA certified arborists can assist you in preparing for the hurricane season by strategically pruning vegetation, branches and limbs for canopy reduction and to reduce wind resistance. This will help to limit cleanup effort and damage if the storm occurs. When major storms are predicted Matteo's Landscaping mobilizes our disaster response cleanup crews and thoroughly inspect all emergency equipment and tools in the event of a call-out. Using professionals to do your hurricane and tropical cleanup and debris removal is advisable since doing it yourself can be extremely dangerous, especially with downed trees and power lines. Property damage and personal injury can be caused by breaking or falling of broken or hanging tree limbs without warning. 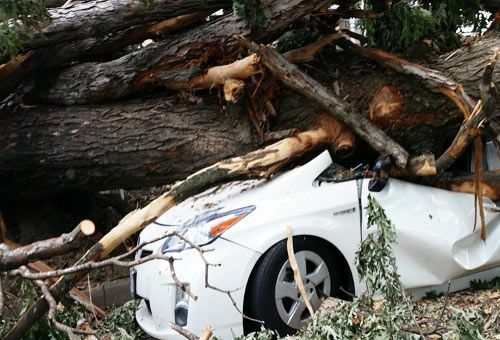 Matteo's Landscaping is fully capable to clear downed tree limbs or remove entire downed trees timely and safely. Our staff is trained in the cleanup of hurricane storm damage and knows the options available, along with the best or most cost effective method of restoring your property to a useable condition. We will remove all trees, debris, trash and wreckage left behind by a storm, floods, fire and other natural disasters. Our inventory of equipment includes bucket trucks, grapple trucks, dump trailers, bobcats, chain saws, and every else you need for storm cleanup and debris removal in South Florida after a hurricane or tropical storm. Storm cleanup and debris removal hopefully are the worst of your worries after a hurricane or tropical storm. Matteo's Landscaping in South Florida is a fully licensed, insured and a professional landscaping and tree service contractor. Our disaster response clean-up crews quickly and efficiently take care of your urgent cleanup and removal needs when there is no time to wait. We are ready and equipped for any type of cleanup project. Contact us today for more information on our hurricane preparedness, cleanup and removal services at (954) 444-1008 or complete the Contact Us form - click here.